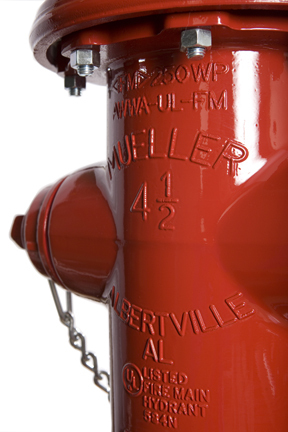 Mueller Co. is one of the largest manufacturers of fire hydrants, butterfly valves and iron gate valves in the U.S. and Canada and offers the broadest product line of valves for residential water and gas systems. Its other product offerings include pipe repair products, water meters, tapping machines and tools, advanced metering infrastructure (AMI)/automated meter reading (AMR) and leak detection and pipe condition assessment technology and services. Sales of these products are heavily influenced by local water department specifications. Mueller Co.'s brands enjoy leadership positions in the water infrastructure industry, including fire hydrants (#1); gate valves (#1); butterfly and ball valves (#1), plug valves (#2) and brass water products (#2). To learn more about Mueller Co. and its industry-leading brands, click on one of the links below.